If you’re a regular at the Food Central eatery right in front of McDonalds, then there’s a chance that you’ve also tried out their brand new branch at Fajar Complex Tawau as well. It’s just recently opened and already it’s somewhat the place to hang out due to its strategic location and variety of food. When we recently went there, we tried out their new-on-the-menu Nasi Lemak Kelantan (which was pretty good but looked suspiciously similar to a Nasi Ayam Penyet dish) while my partner ordered their Nasi Lemak King (also tasted lovely but with a ‘kickingly’ spicy sambal). We also got ourselves some fried popias & fried wontons and both tasted just okay in my opinion but my partner still loves them. Updated on 29/12/2016 - My parents and I stopped by this place recently and noticed that their menu have somewhat expanded, so we tried out their Nasi Lemak 'Bakar' Ayam Masak Merah and also their Kung Pao Chicken Claypot Rice and both were pretty good. My dad also tried this really nice looking (and tasting) Nasi Padang Ayam. After several weeks (yup, I’m not kidding) of Hari Raya celebration, my stomach has finally given up of all those rendangs and buras (you guys from Tawau know what I’m taking about) and is now craving for something different. So after much discussion with the parents, we decided to go to another one of our usual spots, sandwich in between rows of low-to-medium budget hotels in Fajar Complex Tawau. 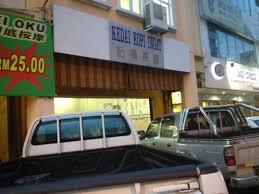 We like the fact that the place is very lay back, as it is your typical kedai kopi establishment, but with good food. And it’s also because it’s one of the places that had opened after the third day of the Hari Raya celebration. We ordered our usual, several of them being Sliced Fish with Curry (my personal favourite – it’s just divine! 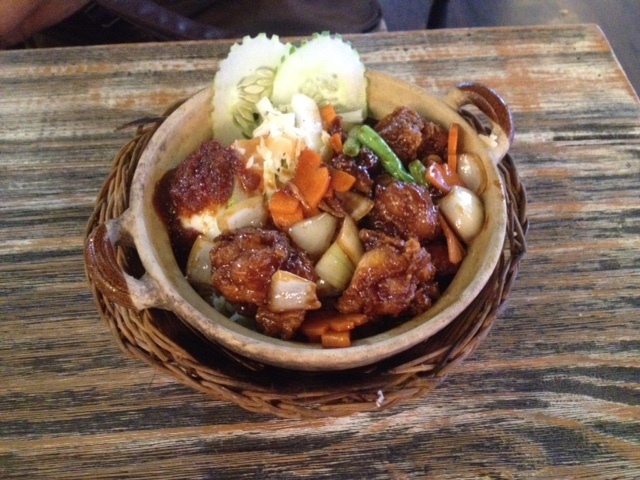 ), Ginger Fish (one of mom’s favourites) Stir Fried Mix Vegetables and Mix Vegetable in Claypot (or something). ~ meals that we had tried out includes chicken burger, fried lekor, cheesy wedges.